Social Responsibility as a value at Vicinay Sestao by putting into practice a strategy characterised by consistency, commitment and ethical behaviour towards people, society and the environment. Vicinay Sestao is a founding partner of the Basque Ecodesign Centre whose mission is to promote the development of ideas and actions in a way that it contributes to improving business competitiveness in the Autonomous Community of the Basque Country and preventing the generation of environmental impacts. It is a leading participant in the implementation of the EU action plan for the Circular Economy. We strive for diversity by carrying out different plans such as equal opportunities for men and women or disability at work. We have a team of dedicated men and women, able to adapt and manage diversity and change to achieve our business goals. At Vicinay Sestao, we carry out numerous solidarity campaigns throughout the year such as toy and clothing collections, food banks, blood donation and summer camps. We collaborate with the Bizkaia Food Bank in solidarity campaigns in the collection of clothes and toys, and we have carried out our first blood donation campaign. We collaborate with foundations and associations through scholarship models promoting entrepreneurship among young people. We participated with the Novia Salcedo Foundation within the Lanaldi Program, whose mission is to provide professional guidance to students in choosing higher education. Participants attend workshops and live a practical experience by accompanying a working professional during a working day. Vicinay Sestao collaborates with Ahalbidetu, a non-profit association whose aim is to help young graduates acquire skills for their future careers. We have launched a new employment generation model, by recruiting youth as external companies. 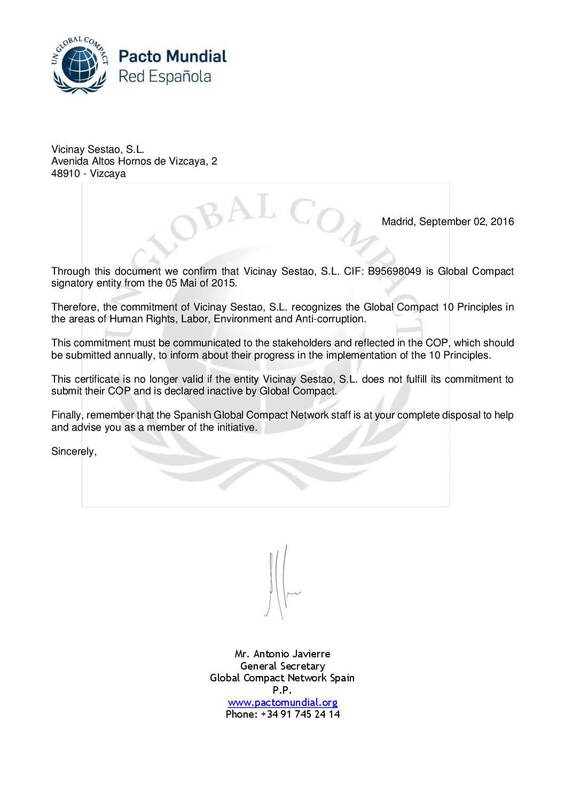 Vicinay Sestao is a partner in the Global Compact Global Compact for ethical management. Global Compact recognises 10 Principles in the areas of Human Rights, Labour, Environment and Anti-Corruption. Avenida Altos Hornos de Vizcaya, 2.